Birmingham Festival Choral Society’s annual Christmas charity carol concert was held at Ladywood ARC last Saturday. The weather was bitter outside, but the atmosphere inside the church was warm and welcoming. The sopranos and altos sang three more works from the much-loved ‘Ceremony of Carols’ in this concert: ‘There is no rose’, As dew in Aprille’ and ‘This little babe’. To redress the balance, the tenors and basses sang ‘In the bleak midwinter’, arranged for men’s voices. A real treat! The remainder of the concert included Joubert’s arrangement of ‘There is no rose’, and carol arrangements from ‘Carols for choirs’ – new and familiar. Christmas poetry, some amusing, some thought provoking, also added to the enjoyment of the evening. The audience joined in the well known carols, and the sopranos had fun singing the descants! The nominated charity this year was BID Services, formerly Birmingham Institute for the Deaf. One of the representatives for the charity told us about the valuable work they do. They then provided sign language interpretation in the hymn ‘Hark the Herald Angels Sing’. There was no excuse for singers not looking at the conductor as he was wearing THAT SUIT once again!!! The concert ended with festive refreshments- mince pies and mulled wine – and a chance to chat to our guests and put some money in the collecting buckets for BID services. Many thanks to Mel, Marilyn and Bryan who sent us photos from the audience. Come to our Christmas Charity carol Concert! Take a break from the Christmas preparations, and come and enjoy an evening of Christmas music with Birmingham Festival Choral Society! Next Saturday the choir will be singing carols old and new, and a selection from Britten’s ‘Ceremony of Carols’. The evening will also include readings of Christmas poetry and opportunities for the audience to join in singing well-known carols. We hope that the concert will raise a big sum for our nominated charity: B.I.D. Services (formerly Birmingham Institute for the Deaf). A representative of the charity will tell us about the important work they do. Last but not least, we’d love you to join us for seasonal refreshments after the concert! Click here for tickets to our concert. St Martin’s in the Bullring was the venue for the ‘Crisis’ Carol Service on Tuesday evening. Birmingham Festival Choral Society was pleased to support this worthwhile charity by leading the carol singing in the service. Our recent connection with Crisis had started two years ago, when they were the chosen charity for our Christmas Carol Concert. We were moved by the stories we heard of the work of the charity, so we were pleased to take up their invitation to lead the singing at their 2017 and 2018 Carol Services. Last year we heard how Crisis had been set up in 1967 with the aim of ending homelessness, and had no idea that they would still be so badly needed 50 years later. This year, the Chief Executive told us that they have prepared a plan documenting how homelessness could be ended in 10 years, if the politicians have the will to make it happen. The charity will keep lobbying to keep up the pressure. The rector of St Martin’s, Revd Jeremy Allcock, spoke about how the Christian gospel should lead to an ‘open hand, open heart and open door’. The stories told by clients were very moving, and reminded us that the loss of a home can be caused by all sorts of circumstances , and affect people of all ages. We heard how the charity helps people with substance abuse, and provides training to help people get into employment, and learn domestic skills. We enjoyed singing the familiar Christmas carols, adding descants too. BFCS also sang ‘Away in a Manger’ to the Jacques tune, and a rousing ‘We wish you a merry Christmas’ at the end. Singing “we all want some figgy pudding” led very naturally to refreshments at the back of the church, and a chance for singers to chat to people involved in the charity and give to the collection. The evening had been thought-provoking, and reminded us how fortunate we are to have our own homes to return to. Christmas cheer at Ladywood ARC! When the title ‘Winter’s Snow’ was chosen for our Carol concert, we could not have foreseen that deep snow would fall on the Midlands the week before! Fortunately, the roads were clear by the time of our Carol concert in Ladywood ARC on 16th December. Our guests were welcomed by the lovely music of a recorder quartet, played by Margaret, Judy, Barry and Margund. The choir, in their bright Christmas colours, started the concert with ‘See amid the winter’s snow‘ followed by some well loved traditional carols. Christmas wouldn’t be Christmas without some John Rutter favourites, and they contrasted with the more complex rhthyms of Sir Christemus (William Mathias) and Ceremonies (written by Patrick Larley for the ‘special birthday’ of one of our sopranos a few years ago). The hauntingly beautiful ‘O magnum mysterium’ by Morten Lauridsen was a highlight for many of the singers and audience. The Christmas music was broken up by Liz’s dramatic reading of the humorous Twelve thank you notes of Christmas (John Julius Norwich), and John Betjeman’s poem Christmas, read by David. Our guests from the Brain Injury Rehabilitation Trust told us of their valuable work, and we were very pleased to find out later that our concert had raised £960 for the Trust. We were a little surprised to find that an organ solo – Bach’s Wachet auf – had been programmed near the end of the concert, and even more surprised when our Music Director, David Wynne, disappeared – but all was explained when he came back, wearing a very dazzling Christmas suit! The concert ended with many smiling faces in the choir, as ‘the suit’ conducted us in Rutter’s Twelve days of Christmas! The evening ended with lots of happy chatter as we shared mulled wine and mince pies with our guests in the audience. Carol Festival at the Cube. 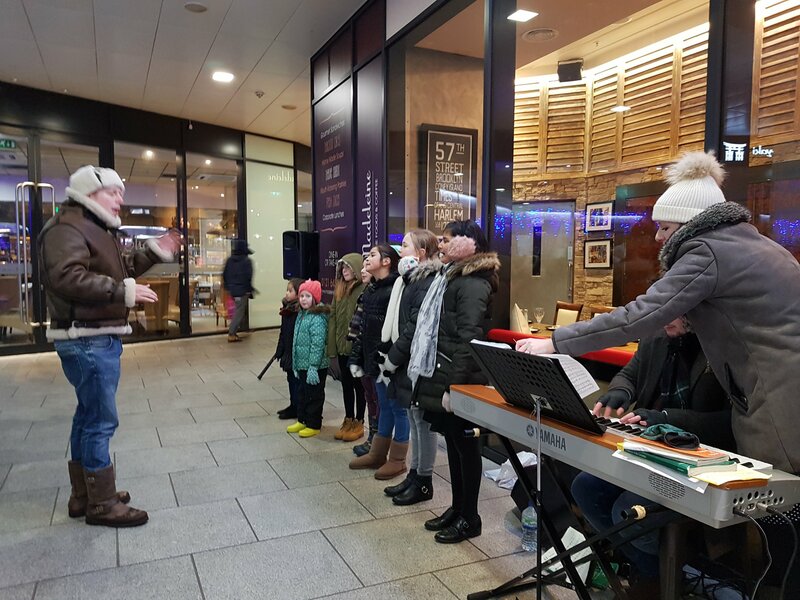 Intrepid singers from Birmingham Festival Choral Society braved the snow and ice on Tuesday to sing carols at the Cube, the distinctive Birmingham landmark containing offices, shops, apartments and restaurants. 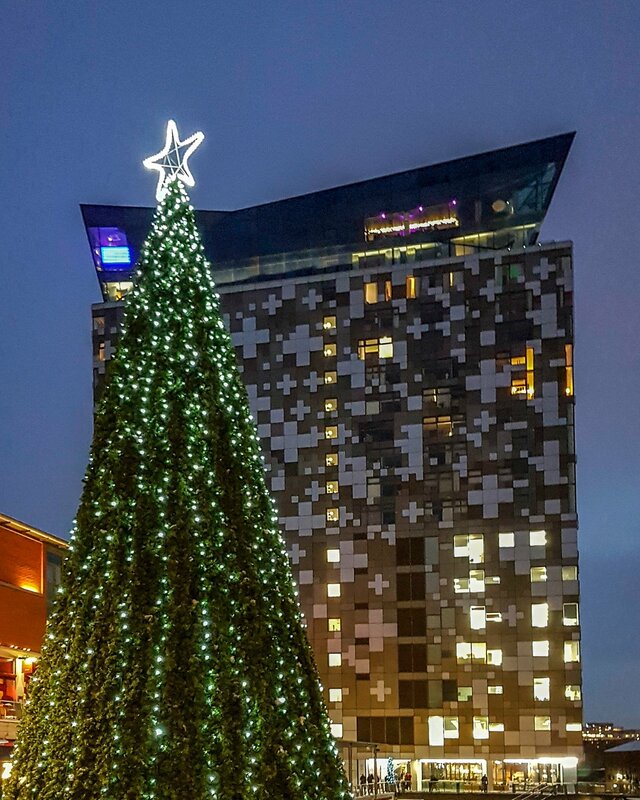 The ‘Carol Festival’ was to raise money for the Birmingham Children’s Hospital, the Cube’s chosen charity. 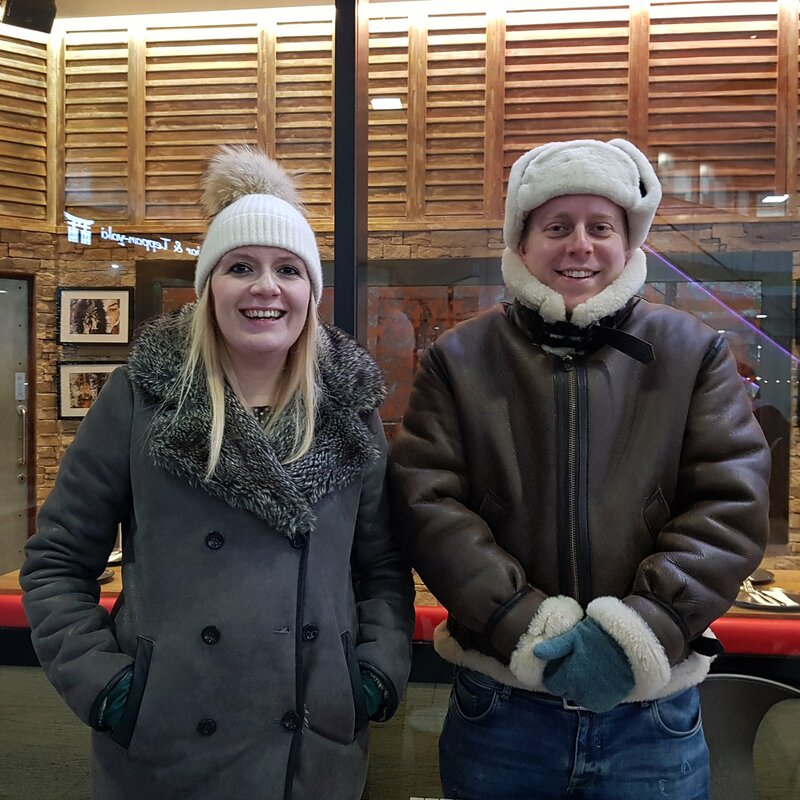 The atrium of the Cube is open to the elements and if you’re wondering whether it was cold, take a look at our two Music Directors for the evening, Alexandra and David Wynne! 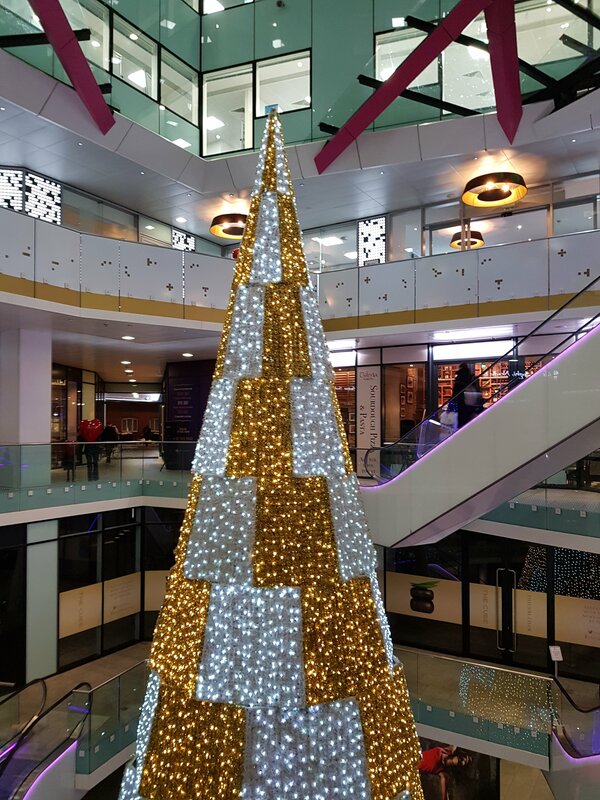 The atrium looked very pretty though, with the huge Christmas tree. BFCS started the evening with a selection of Christmas music, then we were followed by the children of the St Chad’s Children’s choir, led by both David and Alexandra. Finally, we heard from two of Alexandra’s workplace choirs made up of singers from firms based in the Cube. 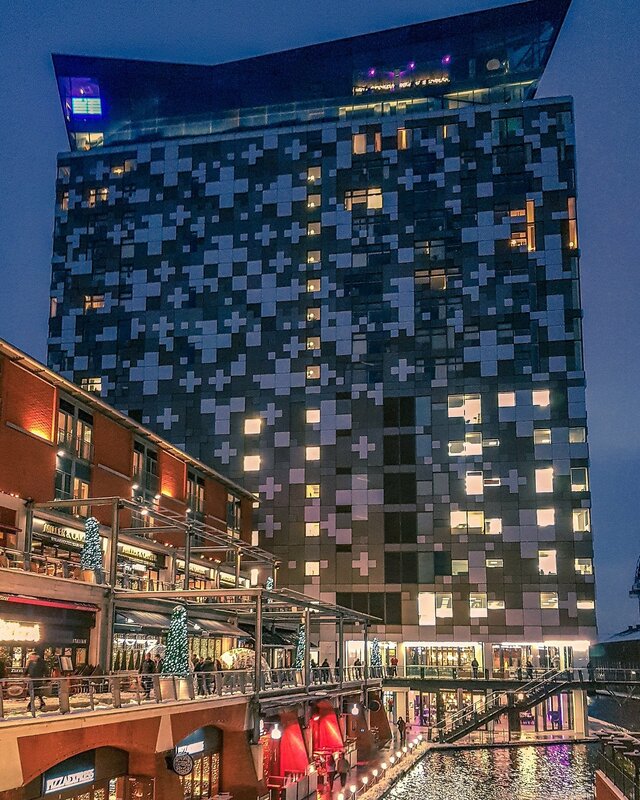 We hope that all those workers, shoppers and diners passing through the Cube enjoyed the Christmas music, and dropped a generous donation in the collecting buckets for the Birmingham Children’s Hospital. Birmingham Festival Choral Society was pleased to support such a worthwhile cause. ‘Crisis’ 50th Anniversary Carol Concert. Singers from Birmingham Festival Choral Society will be leading the congregational singing at the ‘Crisis’ 50th Anniversary Carol concert in St Martin in the Bull Ring, 6 – 7pm on Tuesday 5th December. Homelessness is a subject of concern to us all, and we were moved by the personal stories we heard at our charity carol service in aid of Crisis, last year. Crisis would like to invite you to a very special carol service to mark our 50th anniversary. St Martin in the Bull Ring is a special venue for us and this year, our carol service takes on an even more significance as we mark our 50th Anniversary, and our successes in tackling homelessness over the years. The carol service this year will allow us to reflect on the past fifty years and the remarkable people who have played a part in our history since we were formed as a cross-party awareness raising campaign in 1967. It will also be a chance to come together to focus on our shared goal of ending homelessness for good. Birmingham Festival Choral Society presents our ever popular Christmas charity concert! Come and share Christmas music and carols, followed by festive refreshments. A collection will be taken for the Brain Injury Rehabilitation Trust. Tickets £10 (under 18s free). Click here for tickets. Carols, carols and more carols! Christmas music filled the air at Ladywood ARC last Saturday. A recorder quartet greeted our guests with Christmas music as they arrived. The lights were dimmed, candles were lit, and the choir processed down the sides of the church to take their places and sing ‘Gaudete’. BFCS sang carols old and new, and invited the audience to sing the traditional carols with us. Kevin Gill conducted the choir and introduced the programme – the final concert in his term as caretaker Music Director. We were moved by the short talk from ‘Crisis at Christmas’, particularly the testimony of a young student from Azerbaijan, who had been homeless until Crisis helped her get on her feet. She now has a job and can support herself. Singers and audience gave generously and raised £908 for the charity. We were delighted that the Lord Mayor of Birmingham could attend our Carol Concert, accompanied by the Lady Mayoress. As Councillor Carl Rice, he represents the Ladywood Ward. Crisis at Christmas is a charity they both support. We would like to thank the Lord Mayor for taking the atmospheric candlelit picture of the choir, and posting it on Social Media. The concert was followed by mince pies and mulled wine, and much conversation. The small singing group ‘BFCS in Harmony’, led by Margaret Jones, entertained the Residents of Queen Mother Court, Selly Oak, with Carols on Monday 19th December, and our final Christmas event will be the leading of carol singing at ‘The Highfield’, Edgbaston, on Friday 23rd. The Lord Mayor speaks to representatives of ‘Crisis’. the recorder quartet playing Christmas music as guests arrived. BFCS singers join in Carol Concert for Shelter’s 50th anniversary . 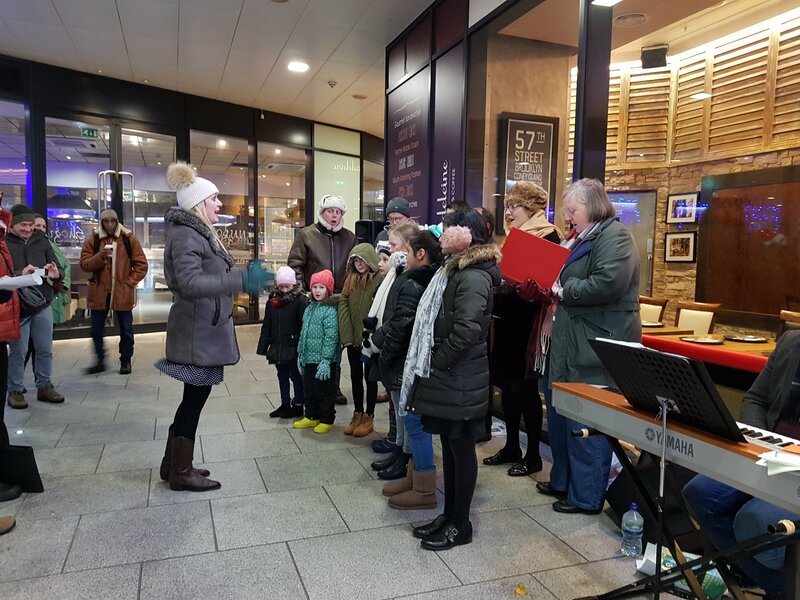 Shelter’s Regional Events manager has written to thank BFCS singers for taking part in the first ‘Shelter’ Carol Service in Birmingham (see letter below). Message to the choir from James Robinson, Regional Events Manager, Shelter. I just wanted to say from myself and on behalf of everyone at Shelter thanks to you and to everyone at the Birmingham Festival Choral Society for being part of our first carol service in Birmingham. I personally very much enjoyed your performance pieces and it was wonderful to have the BFCS voices supporting in the congregational carols. It was hairs on the back of the neck stuff for me! Please do pass on my thanks to everyone who was involved and we hope you all have a very Merry Christmas. Join us for our Christmas Charity Concert on Saturday 17th December at 6pm! Carols for choir and audience, followed by Mince pies and mulled wine. All proceeds to ‘Crisis at Christmas’.